Drunkards normally don't care what they drink, as long as it brings the effect they need. This is the reason many people die in Kenya and other parts of the world when they consume some chemical they have no idea what it is. But as much as you don't care about the drink name, if your vodka is branded ‘REST IN PEACE’ with a coffin-like logo on it you must question the content otherwise you will be a fool who wants to commit suicide. The city County Liquor Licensing Board has warned those who drink against consuming a new brand of liquor manufactured by ‘Left and Gone Group and Company’ for fears that it might be lethal, just because of the name. According to the officers in charge, the company which is based in Dandora is also operating without license. “We have already notified the law enforcement agencies to investigate and take action on the owners of the factory,” said Vincent Shimoli, the board chairman. 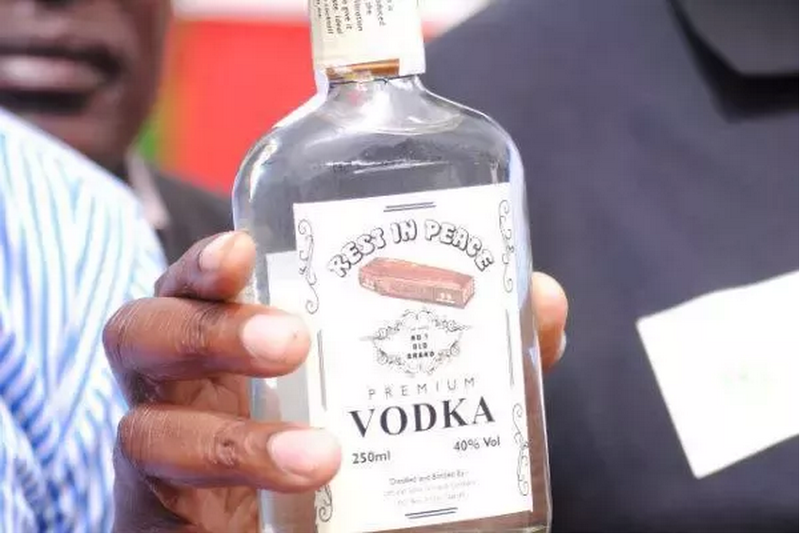 The Rest In Peace Vodka distiller was discovered during a weekly routine inspection around the city which is said to be the leading county in consumption of killer drinks.